Our TODAY'S TMJ4 Community Baby Shower is all day today. Our TODAY'S TMJ4 Community Baby Shower is all day today. You can donate much needed baby items at any local Sentry Foods stores. The items donated will go to agencies like Sojourner Family Peace Center in Milwaukee. The agency helps thousands of women and children every year, impacted by domestic violence, women like Melissa. She first arrived at Sojourner in 2016 with her three children, fleeing an abusive situation. She took classes and participated in support groups. Melissa says "Sojourner saved our lives in a lot of ways. Every time I walked through these doors, I knew that I was understood, I was listened to, I was believed and they helped me learn self-care." Today, she has a career and volunteers on a panel of survivors at Sojourner. During her journey, Melissa received items donated to the TODAY'S TMJ4 Community Baby Shower. She says those items help more than people know. Today, Melissa has a career and volunteers on a panel of survivors at Sojourner. 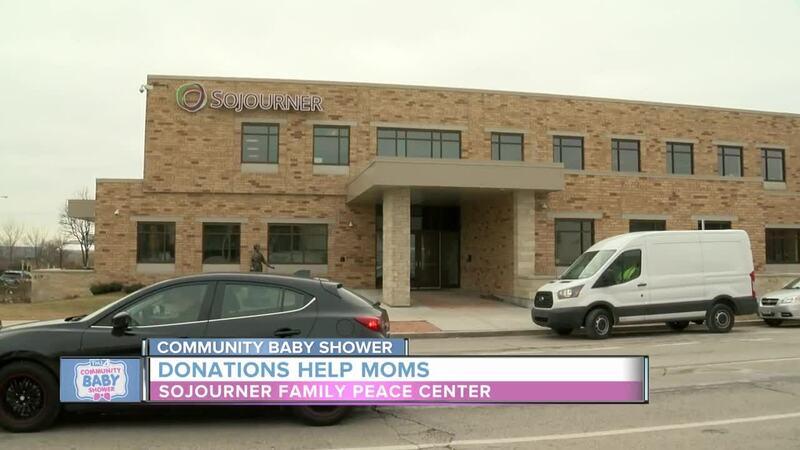 Sojourner President and CEO, Carmen Pitre says the Community Baby Shower is important because "at a difficult time in your life, it can be a relieve to not have to worry about basic needs." Pitre says the agency served more than 11 thousand people in 2017, to the need is great, but the stories she's hearing are more complicated. Pitre says "people are coming in with more mental health issues, more complications related to how they had to survive and the choices they've had to make to survive." She tells Melissa, "you're calm, you're peaceful, you're beautiful. You have your own story to tell." Melissa says it was hard for her to ask for help and that she "couldn't imagine anything worse than asking for help and the resources not being there." Sojourner is one of 10 agencies that will receive the items donated today in our 17th annual event. Sojourner Family Peace Center does have a 24-hour hotline for people seeking help from domestic violence. It's 414-933-2722.